CMS published its final rule, the “Pathways to Success” for the Medicare Shared Savings Program, in December 2018. CMS’ overall goal is clear and unchanged from the proposed rule: to put the “accountability” back in accountable care by moving ACOs more quickly to downside risk. While the final rule tracks the proposed rule issued in August fairly closely, CMS has “softened” some important areas and, notably, is further encouraging program participation by physician-led ACOs. Current and future ACOs applying to participate starting July 1 must submit an intent to apply by January 18, 2019. Full applications for the 5+ year agreement period are due on February 19. CMS has increased the potential for shared savings in the BASIC track. In the upside-only levels (Levels A & B), ACOs may now receive up to 40% of the savings generated. This is less than the 50% sharing rate under the current program, but meaningfully more than the 25% initially proposed. BASIC Levels C, D, and E will receive up to 50% of upside shared savings (compared with 30, 40, and 50% under the proposed rule). Again, this is a notable improvement for Levels C and D, and a further incentive for ACOs ready to take on risk. The final rule, like the proposed rule, introduces 30% downside risk by an ACO’s third performance year. 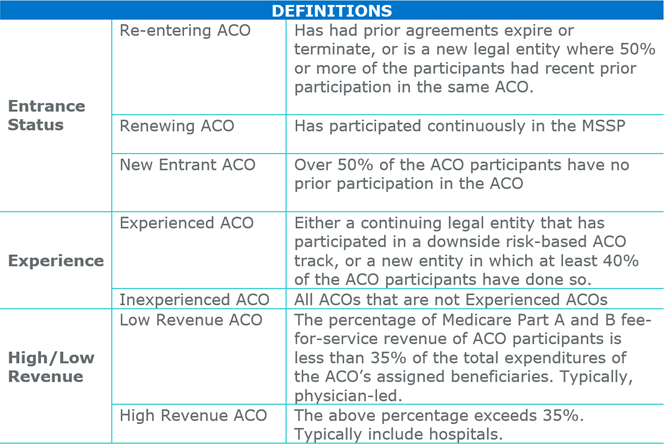 However, an exception was created in the new rule for New Entrant, Low-Revenue ACOs; this is discussed below. Between the proposed rule and the final rule, CMS made changes to specifically encourage participation by Low-Revenue ACOs. The threshold for defining a Low Revenue ACO was raised; the maximum percentage of spend for assigned beneficiaries captured by ACO participants increased from under 25% to under 35%. New Entrant, Low Revenue ACOs can remain in the upside-only Level B for an extra performance year, unlike High Revenue ACOs, which must take on risk by year 3 of their agreement. “In exchange” (per CMS) for the extra year in upside-only, they will need to spend their last two years in Level E (rather than incrementally progressing through Levels C and D). Exhibit 1 shows the options for organizations entering their first agreement period under the new terms (those with existing agreements may complete those periods first, under the terms of the prior rule). 1.High Revenue ACOs with a start date in 2016 or 2017 that entered the Track 1+ model in 2018 may enter Level E rather than Enhanced. Based on an analysis of 2017 performance data, almost 20% of existing ACOs may be subject to further review because they exceeded their benchmark by more than their MSR or failed to meet quality standards. In addition to spending and quality criteria, to renew or re-enter, ACOs will need to have repaid shared losses in full within 90 days, as required for any performance year with downside risk. The final rule suggests that these requirements may be considered met if the ACO demonstrates in its application that it has corrected any of the deficiencies above. Ninety percent of current ACOs that could, have chosen to take the extension to July 2019 that will fill the gap until Pathways to Success begins. While many of these ACOs may just be buying time to make a more informed decision, it is possible that fewer ACOs will drop out than originally estimated. These ACOs may recognize the advantages ACOs provide beyond shared savings. Among these advantages, probably of greatest significance to health systems and hospitals is their role in physician engagement and alignment. ACOs in Levels E and the Enhanced Track also obtain APM status, with the associated payment bonus for physicians. In some markets, there may be other competitive advantages. Physician-led ACOs may perceive their organization as a tool to maintain physician independence. Finally, hospital and system participants may also realize that if they won’t take this kind of “voluntary” risk, CMS may impose mandatory risk in another, more problematic, form in the future. For some, it may simply be time to force the issue of shifting to value-based care.